Thank you for all the feedback. Catastrophic dragons have been revised and added in full PDF glory to the Free Game Resources page on this site. You are all awesome! I really need to thank John Four over at Roleplaying Tips for the inspiration. 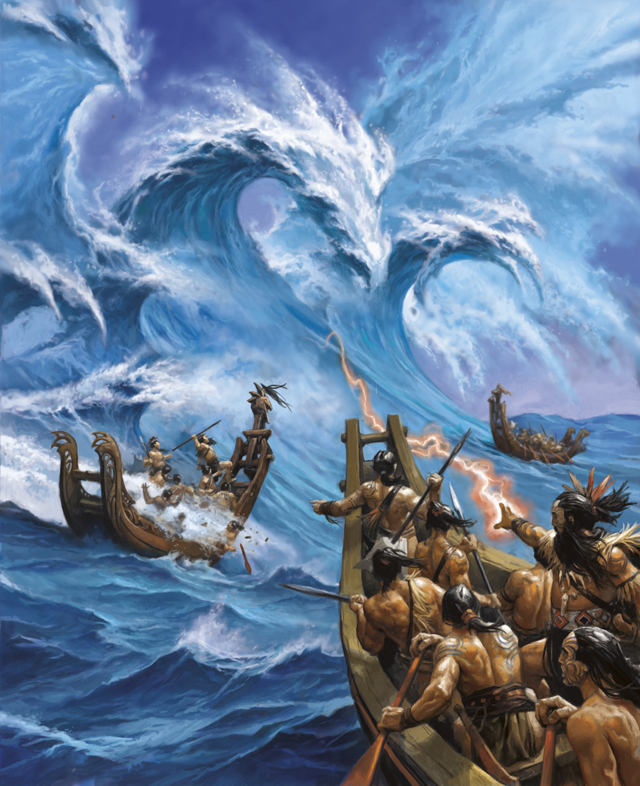 He picked the theme of races for last month’s RPG Blog Carnival. Killer stuff that got me thinking about how much I loved fourth edition’s catastrophic dragons and if there was a way to bring them into fifth edition. Here we are a month later and I’ve brought the blizzard, earthquake, tornado, typhoon, and volcanic dragons fifth edition ruleset. A dragon who cannot cast spells is like French onion soup with cheese. Yes, technically it is indeed the thing it claims to be, but I’m pretty disappointed with the result. Catastrophic dragons, like their chromatic and metallic counterparts, can cast spells. Instead of relying on Charisma, their spells use Intelligence. Why? Well, mechanically it’s because catastrophic dragons have lower Charisma scores and higher Intelligence scores than other dragon types. Also, everyone (including me) loves a good story reason for game mechanics so here’s mine. Much of a catastrophic dragon’s innate magical ability is used in holding its new raging elemental body stable. To keep from exploding, catastrophic dragons must focus their natural magical energies on controlling their chaotic forms. This does not mean a catastrophic dragon cannot learn to cast spells. Many pour over ancient tomes and texts, learning magic long forgotten, and some even create their own spells which they are eager to show off. Because these spells are learned and not innate abilities of catastrophic dragons they use the following variant rule. Some catastrophic dragons keep spellbooks, just like wizards. A young or older catastrophic dragon can cast and prepare a number of spells per day from its spellbook equal to its Intelligence modifier, requiring material components as usual. 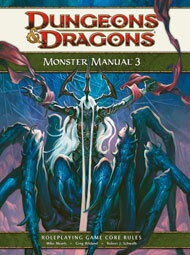 The spell’s level can be no higher than one-third the dragon’s challenge rating (rounded down). The dragon’s bonus to hit with spell attacks is equal to its proficiency bonus + its Intelligence bonus. The dragon’s spell save DC equals 8 + its proficiency bonus + its Intelligence modifier. 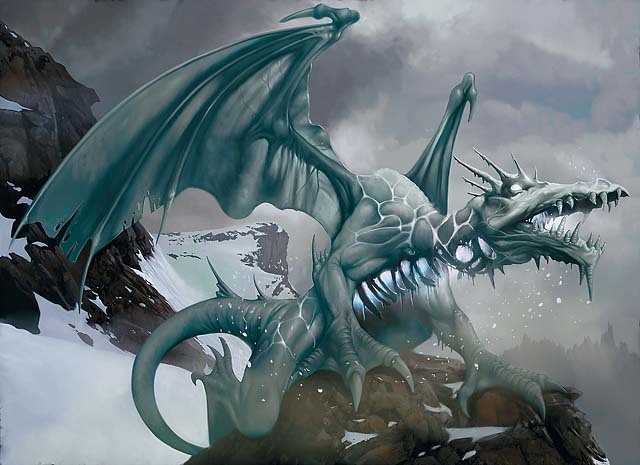 Last week I explored bringing fourth edition’s catastrophic dragons into fifth edition D&D. The blizzard and earthquake dragons were first on my list. Today I’d like to share the volcanic dragon with you. This dragon is the baddest of the bunch and has an attitude to match. Here are a few quick words about my take for catastrophic dragons. This is from my first post last week. You can just skip ahead of you’ve already been reading these posts. Volcanic dragons have skin made of barely cooled molten rock. Cracks in their skin large and small show off the dragon’s glowing lava insides, which grow brighter as the dragon becomes more agitated. Heat and embers radiate from the dragon’s form and getting too close can result in a toxic death before the dragon ever lays claws onto a victim. A dry heat wave heralds the volcanic dragon’s approach. Righteous Rage. Like all catastrophic dragons, rage constantly simmers in the heart of the volcanic dragon. The rage of the volcanic is one of a wronged creature out for justice. Volcanic dragons see the destruction of life as their righteous mission. As the mutliverse’s superior beings they must destroy any non-elemental they come across as just punishment for their imprisonment. Most carry this twisted belief in their heart until the end of their days. Chromatic Hunters. With a warped idea of justice in their minds, volcanic dragons are the dragons most likely to hunt and kill chromatic dragons. Since they share a love of volcano lairs, volcanic dragons will often challenge an established red dragon and try to take its home. These battles are brutal, as both creatures are unaffected by the heat and must use claws and jaws to battle. Volcanic dragons tend to create lairs in their namesake. 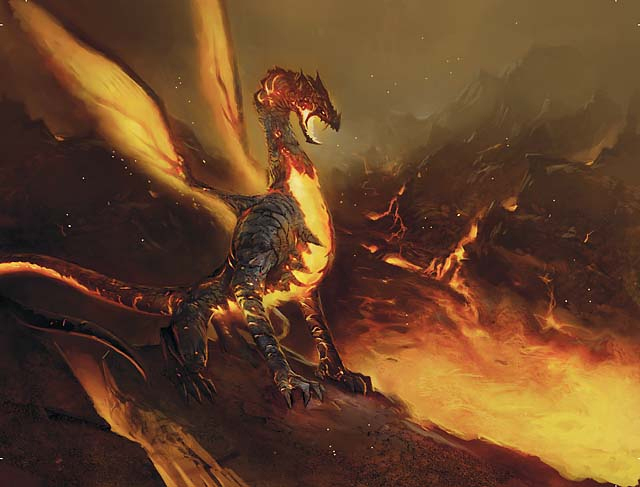 Since many volcano lairs are occupied by red dragons, volcanic dragons do not build their own, but rather siege the lair of a red dragon, kill the host, and claim the volcano as their own. Volcanic dragons do make modifications to their stolen homes. They open cracks in the walls of the tunnels, allowing even more lava and noxious fumes inside to make the place habitable only by creatures who fear neither fire nor poison. Pieces of the defeated red dragon’s corpse are mounted here and there as a show of the volcanic dragon’s dominance. The cunning volcanic dragons rig their lairs with all manner of unexpected traps as well. Knowing their opponents may have prepared with spells and items to help them resist flames, volcanic dragons often create magic traps which deal acid, cold, and lightning, to show any who might think themselves clever that they cannot hope to outsmart a cunning dragon in its home.